If you're anything like me, you're already planning what to wear on Christmas, Christmas Eve, and other gatherings this week! I don't usually buy anything new specifically for holiday occasions, but there are definitely some finishing touches you can add to your look that add a bit of holiday glam! Here are a few quick tips I came up with to spice up your look! I always feel glamorous when I wear a statement earring, and I feel like they instantly add interest and elegance to any outfit. I loooooove a dark berry or burgundy look for the holidays! So polished and chic. Anytime I wear faux fur I feel like I have a little diva moment. 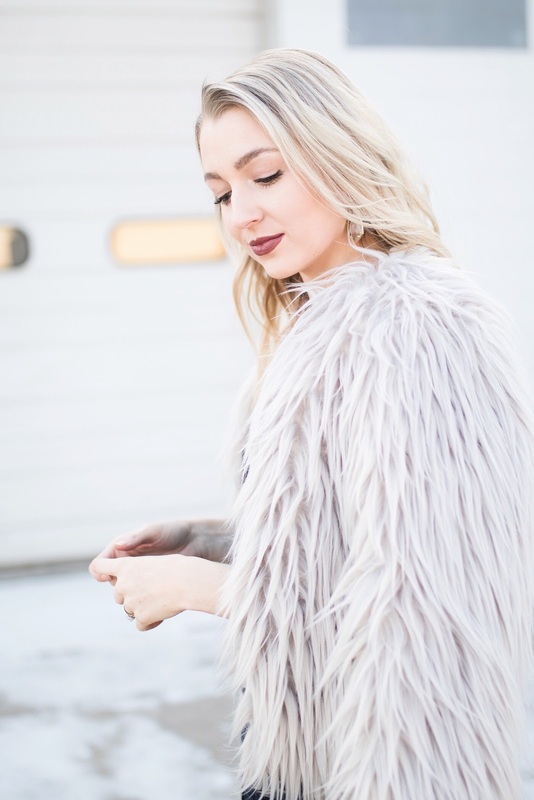 I love that faux fur jackets and coats are big this year because they keep you warm in the winter while also making you look super fashion-forward and chic! I'm still rocking bare nails as of today, but a holiday manicure is on my to-do list this week! Red is always a go at Christmastime, or to mix it up I like to do burgundy or gold. Something about lace just exudes elegance, especially in the wintertime. Whether it's trim on a top, or a lace dress, lace is lovely for the holidays.